As some long time readers are aware, in addition to writing Lines and Colors, I’m also a designer, painter and cartoonist. I’ve just taken my first run at creating an instructional YouTube video in support of my book, Dinosaur Cartoons. How to Draw a T.rex Cartoon Dinosaur is an 11 minute step-by-step tutorial in which I go through the process of drawing a cartoon in the manner most often used by professional cartoonists and illustrators — working out the drawing first with simple shapes and construction lines in pencil, creating the finished drawing over that in ink (or marker) and erasing the pencil out from under the ink as one might do with a drawing intended for reproduction. When the book was originally released, I did a number signing sessions in Barnes & Noble stores and independent bookstores in which I taught kids how to draw cartoon dinosaurs. I’ve tried to adapt that approach here. Though I’ve created a dinosaur cartoon drawing tutorial before as a web animation, this is the first in what I hope to be a continuing series on how-to videos, that will have their own YouTube channel. My first video is a little rough around the edges (perhaps I went a little too “Bob Ross” in my soft spoken voice-over), but I’m just learning how to make instructional art videos. As I go on, I’ll try to report back with some of what I’m learning about that process. I will say that the first thing I’ve learned, unsurprisingly, is that it’s a lot of work to try and do something like this right. There are any number of art instruction videos on YouTube with poor production values, low quality sound and little or no evidence of editing. I’ve tried to take my cue from artists who are producing their own art videos, but putting in the effort and attention necessary to bring them up as closely as possible to a professional level (a prime case in point being James Gurney, whose self-produced videos are wonderfully done). As I go on, I’ll announce new videos in the series in the Lines and Colors sidebar, and when I have enough information about the process of creating DIY art instruction videos, I’ll try to collect that in another post. Tom Gauld is a Scottish cartoonist and illustrator whose deceptively simple style is simply delightful and simply perfect accompaniment to his wry sense of humor. Gauld is a regular contributor to the (most excellent) British newspaper The Guardian, where his “cultural cartoons” are often literary in subject matter, and New Scientist, where they are obviously science themes, as well as The New York Times. Gauld’s quirky turns on subjects both historic and contemporary (often mixed) can give you a delightful simultaneous brain tweak and laugh. His website portfolio is not extensive, you can find more on the Guardian site or on his Instagram, Tumblr or Twitter feeds. The image above, bottom, is part of this amusement on The Laurence Sterne Trust, in which you can assemble sections of it multiple ways. Gauld is the author/illustrator of a number of books, including: You’re All Just Jealous of My Jetpack (cartoons), Goliath (graphic novel) and Mooncop (graphic novel). His latest book of cartoons is Baking With Kafka. Those in LA, can see Tom Gauld interviewed by Mark Frauenfelder tonight, November 6, 2017 at Skylight Books in Silver Lake at 7:30 pm. Leo (L.J.) Jordaan was a Dutch anti-fascist artist and political cartoonist who was living and woking in Amsterdm at the time of the Nazi occupation of the Netherlands in 1940. Prior to the invasion, Jordaan has been working for the magazine Green. The Nazi occupiers shut down the magazine, along with most of what could be called a free press — always an enemy to fascists — and Jordaan took his work to underground publications. Jordaan had a powerful graphic style, emphasized by his use of both dark and light hatching. He showed the Nazis a bringers of death, terror and pestilence to his beloved Netherlands, and was particularly harsh on Dutch fascist sympathizers, who he portrayed as shooting loyal Dutch in the back. His most famous image was “De Robot” (images above, third from the bottom), which portrayed the Nazi war machine as an unstoppable robot trampling Dutch soldiers beneath its metal boots. It was published in the underground newspaper De Groene Amsterdamme (“The Green Amsterdamer”) during the occupation. 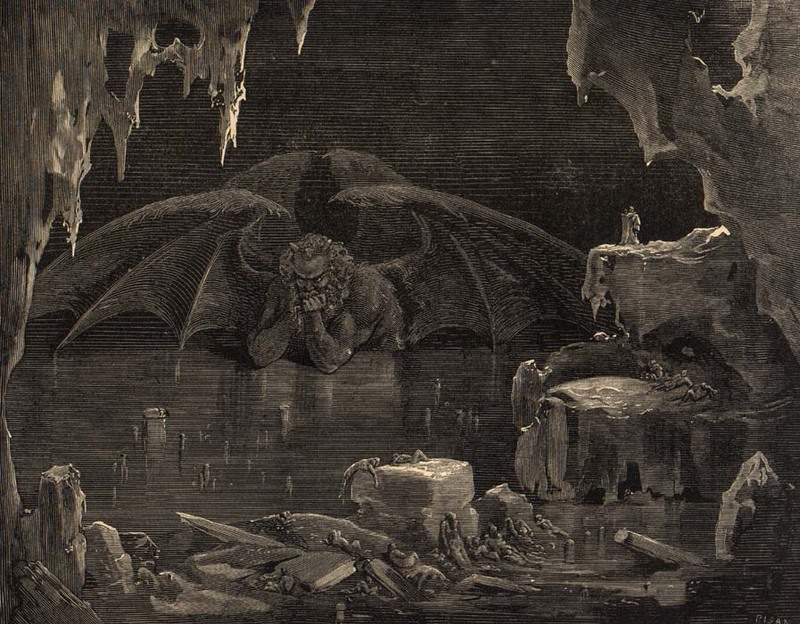 His portrayal of Hitler as a brooding Lucifer (above, second from bottom) seems to give a nod to Gustave Doré’s image of the Ninth Circle of Hell. The image of Christ in thorns above him refers to an image I’ve seen before, but I don’t actually know its origin. It may be a Gothic or early Renaissance icon. In the image above, bottom, we find Jordaan mocking the Nazis’ attempt to appropriate Dutch culture — and Rembrandt in particular — as part of “Aryan Heritage”. Jordaan survived the occupation, and after the war became a noted film critic. The best source for images of Jordaan’s work is the Illustration Art blog, which has comments under some of the images that put them in context. Also good is this post on Dr. Tenge whhich features large images. Cartoonist, caricaturist, comics artist and illustrator illustrator Jack Davis had a pen that connected directly to the funny bone. Noted for his horror comics work for EC Comics and Warren magazines, his movie posters, TV Guide covers, celebrity caricatures and, in particular, his loopy, wild, frenetic, over-the-top and uncannily hilarious comics and covers for Cracked and MAD Magazine, Davis influenced cartoonists and comics artists across the board. Davis often left his readers in simultaneous paroxysms of laughter and wide-eyed admiration for his drawing skills, producing contorted reading positions that looked like.. well, like jack Davis illustrations. Jack Davis died on July 27, 2016 at the age of 92. The links below are mostly to recent obits and articles. For more links to image resources, see my previous post on Jack Davis. Among the 12 dead and 11 wounded in today’s cowardly and loathsome attack on the offices of the French satirical newspaper Charlie Hebdo in Paris were four cartoonists: Georges Wolinski, Jean Cabut, Charb (Stephane Charbonnier) and Tignous (Bernard Velhac). Charlie Hebdo (Charlie Weekly) is known for it’s provocative cartoons and mocking satires of religious fanatics (across the board), political corruption and whatever they find worthy of ridicule. They have pissed off just about everyone, but they have particularly come under attack from professed Muslim extremists (I say “professed” because claiming you are something does not make it true, and certainly does not give you the right to speak for others). The Charlie Hebdo offices were firebombed in 2011, supposedly in response to cartoons about the Prophet Muhammad. To those who are tempted to respond to this kind of act with anti-Muslim sentiment, I’ll point out that in doing so, you are handing these terrorists their victory. They want nothing more than to incite kneejerk, reactionary anti-Muslim sentiment in the West, and fan the flames of religious and cultural intolerance on all sides. To do so allows them to think they are warriors in a holy war, rather than the rat-like, delusional petty criminals they are. Those who are doing the most to defeat their aims are spreading messages of tolerance and acceptance, not returning hatred for hatred. Supporters of freedom of expression are using the phrase “Je Suis Charlie” (I am Charlie) and the hashtag #JeSuisCharlie in messages of solidarity around the world. [Addendum: Slate has been publishing some of the responses to the tragedy, in the form of cartoons, from cartoonists in France and elsewhere: #JeSuisCharlie: Cartoonists Raise Their Pencils in Solidarity With Charlie Hebdo.